In addition, refer to sk111158 - Central Deployment Tool (CDT). for software deployment on Gaia OS, which supports deployments of single HotFixes (HF), of HotFix Accumulators (HFA), and of Major Versions. Valid license has to be installed on the target machine. Valid Software Subscription or Technical Support Contract has to be associated with the license. The Contract File must be installed on the target machine. Please allow up to 24 hours after installing the Contract File before using CPUSE. There is a 30 days grace period upon first installation/activation of the Gaia Software Updates Agent, during which no license is needed at all. Evaluation License is not enough to enable Gaia Software Updates. A real valid support license is required. Access to Check Point Download Server is available via subscription only. An Evaluation License is not sufficient to grant download access from the User Center. per sk94508 (SmartDashboard - "Policy" menu - "Global Properties" - "Security Management Access"). Manual offline installation of CPUSE packages is available if Gaia machine is disconnected from the Internet. 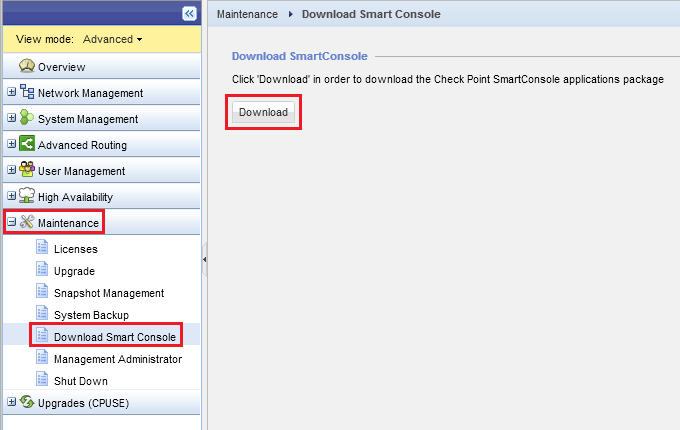 To allow CPUSE to communicate with Check Point cloud, follow the steps below in SmartDashboard. Check Point Security Gateway running on Gaia OS, which must connect to Check Point cloud. Note: For non-Check Point FireWall, the equivalent rule must be created. Related solution: sk83520. Go to "Manage" menu - click on "Network Objects..."
Click on "New..." button - select "Domain..."
In the "Name" field, paste the name of the domain listed above (note the dot in the beginning) and click on "OK". Repeat Steps i-iii for all domains listed above. Important Note: Rules with Domain Objects should be located as low as possible in the rulebase. 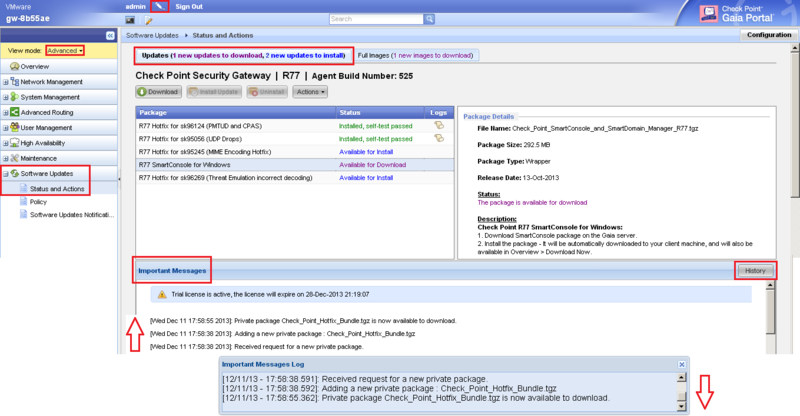 Install the policy onto involved Security Gateway. CPUSE Agent must always be updated to the latest available version before being able to perform any action. 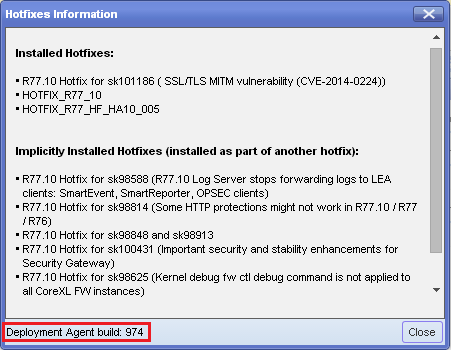 It is recommended to leave the default CPUSE Agent policy set to "Periodically update new Deployment Agent version (recommended)". On offline Gaia machine (that is disconnected from the Internet), it is strongly recommended to always update the CPUSE Agent to the latest available build. Files saved outside of the /home directory are erased during the upgrade process. If you created a snapshot immediately before upgrading, you can revert to the snapshot to recover personal files saved outside of the /home directory. import the configuration using Advanced Migration (refer to the R77 Installation and Upgrade Guide). Major Upgrade using CPUSE on IP Appliances running Gaia OS is supported only in Clish. To import a CPUSE package, the /var/log/ partition on Gaia OS must have enough free disk space - at least twice the size of the package you want to import. [Expert@HostName:0]# df -h | grep -E "Avail|/var/log"
[Expert@Gaia:0]# df -h | grep -E "Avail|/var/log"
at least as the size of the root partition. [Expert@HostName:0]# df -h | grep -E "Avail|\/$"
[Expert@Gaia:0]# df -h | grep -E "Avail|\/$"
The unallocated disk space could be freed by removing Gaia snapshots (if any exist), and by following sk91060. Check Points always recommends to upgrade the CPUSE Agent to the latest available build. Note: Latest build is usually gradually released to all customers. Therefore, not all machines might receive the latest build at the same time. Navigate to Upgrades (CPUSE) section (in Gaia OS R77.20 and above) / to Software Updates section (in Gaia OS R77.10 and lower) - click on Status and Actions page. Build of the installed Deployment Agent is displayed at the top. Connect to command line on Gaia machine. [Expert@HostName:0]# cpvinfo $DADIR/bin/DAService | grep -E "Build|Minor"
Updating of CPUSE (Gaia Software Updates) Agent from build 839 and above does not cause traffic outage, or cluster failover. Updating of CPUSE (Gaia Software Updates) Agent from build 822 and lower might cause short traffic outage, or cluster failover. For details, refer to sk106696. Transfer the CPUSE Agent package (DeploymentAgent_<build>.tgz) to the machine (into some directory - e.g., /some_path_to_CPUSE/). During the installation, you will see the "Waiting for DAService to stop..." message. The preinstall script tries 60 times to stop the DAService executable (by issuing the "dbget installer:stop" command). If the script does not succeed to stop the DAService, then it kills it and the installation continues. To improve CPUSE Agent, new CPUSE commands are added to Clish from time to time. It is necessary to restart all Clish daemons for new CPUSE Clish commands to become available, and to restart ConfD daemon. If your default shell is CLISH (/etc/cli.sh), then log in to Expert mode. If your default shell is BASH (/bin/bash), then log out from all Clish sessions. Important Note: If your default shell is CLISH (/etc/cli.sh), then after issuing this command, you will be disconnected / logged out from all active sessions. When confd daemon is starting, by design, it restarts any currently running routed daemons (by sending a TERM signal). It is done to avoid possible issues in Gaia Clish (e.g., returning invalid results for routing-related commands like "show route"). Since routed daemon is responsible for all the routing in Gaia OS, short traffic outage will occur while routed daemon is being restarted. Since routed daemon is a Critical Device in Check Point cluster (since R76), cluster fail-over might occur while routed daemon is being restarted (refer to sk92878). Important Note: After the desired CPUSE package is downloaded / imported, proceed to sub-section "(4-B) How to work with CPUSE - How to install a CPUSE package". requirement "CPUSE communication with Check Point cloud" above, and to sk83520). CPUSE package is available on the Check Point Cloud. Gaia machine is not running in VSX Mode (in which case, Gaia Portal is not available). All packages are displayed in categories and by default are filtered to view recommended packages only. and in the output of Clish command "show installer package <Package_Number>". The status of the package will change to "Pausing Download"
The status of the package will change to "Resuming Download"
Proceed to sub-section "(4-B) How to work with CPUSE - How to install a CPUSE package". Contact Check Point Support to get the relevant CPUSE Identifier. the exact name of the regular package for required hotfix as appears in the "File Name" field on the hotfix Download Page. Currently, only the following keys are supported in this field: Left/Right arrow, Delete, Backspace. Downloading the hotfix by its URL is not supported. Packages that are not suitable for this machine, will not be available (e.g., if some Take of a Jumbo Hotfix Accumulator is installed, then Takes lower than the current Take will not be available). Click on the magnifying glass icon to start the search. When the package is found, it will be displayed as a link along with its title and release date. Click on the package to add it to the list of available packages. The package will be added with status Available for Download, and the filter will automatically change to show all packages. If you only downloaded the package (without installing it), then proceed to sub-section "(4-B) How to work with CPUSE - How to install a CPUSE package". If this Gaia machine is running in VSX Mode, then refer to section "(2) System requirements and limitations" - subsection "H. VSX Gateways". Note: For details about Clish commands, refer to section "(4-D) How to work with CPUSE - "How to ..." (Gaia Clish commands, Gaia Portal actions, configuration, etc.)". in "Gaia Portal" - "Upgrades (CPUSE)" section (in Gaia R77.20 and above) / to "Software Updates" section (in Gaia R75.40 - R77.10) - "Status and Actions" page. Result: Verifier results: Clean Install: Installation is allowed. Upgrade: Upgrade is allowed. Note: Requires CPUSE build 802 and above. Note: Packages that are not suitable for this machine, will not be available. Gaia machine is disconnected from the Internet (meaning, no access to Check Point Cloud). CPUSE package is not available on the Check Point Cloud. Although Gaia machine is connected to the Internet, administrator wishes to manually import a CPUSE package instead of downloading it from Check Point Cloud. and Gaia Portal actions for CPUSE" - "Show / Hide how to export a CPUSE package in Gaia Portal". Requirements for free disk space exist. For details about Clish commands, refer to section "(4-D) How to work with CPUSE - "How to ..." (Gaia Clish commands, Gaia Portal actions, configuration, etc.)". Make sure you have the relevant CPUSE offline package (TGZ file) / exported package (TAR file). Connect to Gaia Portal on the target Gaia OS. Navigate to Upgrades (CPUSE) section (in Gaia R77.20 and above) / to Software Updates section (in Gaia R77.10 and lower) - click on Status and Actions page. In the Import Package window, click on Browse... - select the CPUSE offline package (TGZ file) / exported package (TAR file) - click on Import. Cannot import package <Name_of_File>. It is not a valid CPUSE package. Refer to the package's official documentation to get a list of compatible machines. For more information, contact Check Point Technical Services. Requires CPUSE build 802 and above. Transfer the CPUSE offline package (TGZ) / exported package (TAR) to the target Gaia machine (into some directory, e.g., /some_path_to_package/). Connect to command line on the target Gaia OS. Note: When import completes, this package is deleted from the original location. Note: Requirements for free disk space and limitations in VSX mode exist. Machine is rebooted automatically (only if required so by the installed hotfix). Connect to command line on Gaia OS. 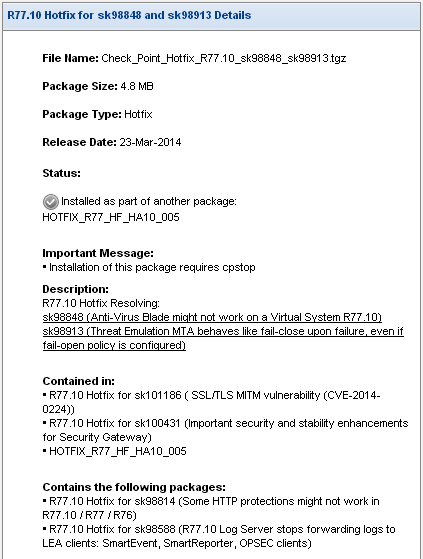 Result: Package Check_Point_Hotfix_R77_10_sk102673.tgz was installed successfully. Note: If machine was not rebooted by the installed package, it might be necessary to connect to command line and to manually run the cpstart / mdsstart command. Note: Once you see "Extracting Bundle", press CTRL+C. 8226; MDS R77.10   Note: After the package is installed, the gateway reboots. After reboot, the machine is fully upgraded to the Minor Version. Important Note: Existing OS settings and the Check Point Database are preserved during this procedure. Requirements for free disk space and limitations in VSX mode exist. Upgrade to a Major version is performed on a new hard disk partition, and the "old" partition is converted into Gaia Snapshot (the new partition space is taken from the un-partitioned space on the hard disk. After this upgrade, there will be an automatic reboot. Upgrade is still running. Log in to the Status and Actions page to see the progress. "Upgrade is still running. Log in to the Status and Actions page to see the progress." You will see the relevant progress (no need to refresh the page). If you upgraded a Security Management Server / Multi-Domain Security Management Server, then install the policy onto all managed Security Gateways / Clusters. If you upgrade a Security Gateway / Cluster Members, then install the policy on this Security Gateway / Cluster. Note: Once you see "Validating Install", press CTRL+C. Note:      After this upgrade, there will be an automatic reboot. Existing OS settings and the Check Point Database are preserved. Important Note: Existing OS settings and the Check Point Database will be overwritten during this procedure. Either select the package and click on Clean Install button on the toolbar. Connect to Gaia Portal and complete the First Time Configuration Wizard. Note:      This installs a new machine. Existing OS settings and the Check Point Database will be overwritten. There will be an automatic reboot. Gaia OS prompts to run the First Time Configuration Wizard. This system is for authorized use only. In order to configure your system, please access the Web UI and finish the First Time Wizard. Refer to sk107320 - How to know if a hotfix on Gaia OS was installed via CPUSE of via Legacy CLI. If a Hotfix / Minor Version package was installed using Legacy CLI, then it can be uninstalled using the CPUSE. If a Hotfix / Minor Version package was installed using CPUSE, then it must be uninstalled using CPUSE. If a Hotfix / Minor Version package was installed using Legacy CLI, then it must be uninstalled using Legacy CLI. To uninstall a Major Version, machine should be reverted to the previous snapshot. You will get uninstall options window. Machine is rebooted automatically (if required so by the uninstalled package). Refer to R77 Versions Gaia Administration Guide - chapter "CPUSE" - section "Reviewing CPUSE - clish". Shows only packages with status "Available for Download" and "Partially Downloaded"
Shows only packages with status "Downloaded"
and section "Configuring CPUSE Mail Notifications - clish". Currently, it is not possible to view the e-mail notifications settings in Clish (only to configure). If the category was enabled, then the corresponding attribute will appear with value true. If the category was never enabled, then the corresponding attribute will not appear at all. If the category was never disabled, then the corresponding attribute will appear with value false. Sets the period, in hours, between checks for available packages in the cloud. Step "(3-C) How to manually install the CPUSE Agent package" - Step 5. Note: The configured period is saved in Gaia Database in seconds. download, Gaia OS downloads it from Check Point Cloud and installs it automatically (CPUSE Agent "self-update"). that CPUSE (Gaia Software Updates) Agent must be updated first. (this attribute is removed when this box is checked). This information is collected to monitor and improve the Software Updates on the Check Point Download Center. Refer to R77 Versions Gaia Administration Guide - chapter "CPUSE" - section "Downloading and Installing with CPUSE - clish". This section (yellow rectangular at the top) shows important static messages - e.g., about CPUSE license, whether a reboot / restart of Check Point services is required. Important notifications appear for several seconds in status bar at the bottom of Gaia Portal in yellow pop-up (these are important messages and are saved in the CPUSE Agent log files /opt/CPInstLog/DeploymentAgent.log.*). This window displays the log only for the last 10 minutes. Note: To see complete technical details about the operations performed by CPUSE (Gaia Software Updates) Agent, refer to /opt/CPInstLog/DeploymentAgent.log. * files. The general messages from CPUSE Agent are displayed in the Event Log. This window displays the general messages only for the last 10 minutes. Events in this window are displayed in the ascending order (the latest event is at the top). To see the full log file, click on the Save full event log button in the upper right corner. Web browser will save the /opt/CPInstLog/DA_UI.log file to your computer (events in this file appear in the descending order - the latest event is at the bottom). Gaia Take number is displayed near the version. Additional operations on the package are available in the "More" button menu, or in the right-click menu. Note: The package installation log is located in /opt/CPInstLog/ directory. Hotfixes Check Point's software updates and Jumbo Hotfix Accumulators, for security fixes and feature improvement. Released after fixes for issue(s) were developed and tested. 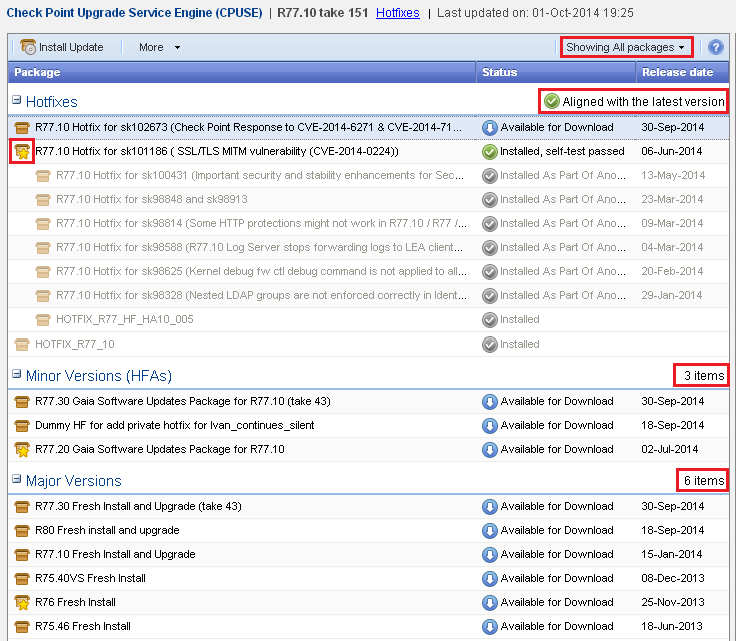 Minor Versions (HFAs) Maintenance releases on top of major releases. Include the latest fixes released to customers. Major Versions Introduce new functionalities and cutting edge innovative technologies to the market while maintaining high product quality. All packages are displayed in a hierarchy - parent package and its child packages are nested. Each category can be collapsed or expanded by clicking on the category title. When clicking on the category title, the explanation about the category is displayed in the right section. The number of packages in each category appears to the right of the category title (in the end of the line). The displayed number of packages depends on the current filter (see the next bullet). If there are no available / installed packages in the category, then no number will be displayed. If all the recommended packages in the category were already installed, then it will show "Aligned with the latest version". (Note: this yellow star appears only if the Gaia machine is connected to the Internet (this information is obtained from Check Point Cloud). will be grayed out (refer to sk107320 - How to know if a hotfix on Gaia OS was installed via CPUSE of via Legacy CLI). or an HFA that includes several package) will be displayed with status "Installed As Part Of Another Package" and will be grayed out. Click on a package to see additional information about the package. This information is displayed in the right section. Note: Currently, this operation is available only in Gaia Portal. The package will be saved on your computer as a special TAR archive file that contains the necessary files. downloaded / installed (see the instructions how to export a CPUSE package in Gaia Portal). Do not change the package name. Result of this test will be displayed in a pop-up. Packages that are not suitable for this machine, will not be available. The package will be added with status Available for Download and the filter will automatically change to show all packages. Refer to R77 Versions Gaia Administration Guide - chapter "CPUSE" - section "Configuring a CPUSE Policy - WebUI". Note: After any change in settings, you need to click on "Apply" button. These settings control how to download CPUSE packages of "Hotfixes" (does not apply to "Minor Versions (HFAs)" / "Major Versions" packages). automatic If enabled, CPUSE Agent downloads packages when they become available. This setting is used for sanity check after installing a CPUSE package. If this box is checked, then CPUSE runs a fall-back procedure if the installed CPUSE package fails one of the sanity tests enabled in the Self Tests to perform sub-section - CPUSE would automatically restore the version that was active before the CPUSE package was installed and send a notification that the installation failed. If this box is checked (default), then, if an updated version of CPUSE (Gaia Software Updates) Agent is available for download, Gaia OS downloads it from Check Point Cloud and installs it automatically (CPUSE Agent "self-update"). Important Messages (yellow section at the top) will show "click here" to download the new version. If administrator attempts to install any other software update, a warning will appear saying that CPUSE (Gaia Software Updates) Agent must be updated first. The following setting is added to the Gaia Database: installer:self_update_policy_no_permission 1 (this attribute is removed when this box is checked). Refer to R77 Versions Gaia Administration Guide - chapter "CPUSE" - section "Configuring a CPUSE Policy - clish". Note: When updating CPUSE Agent from build 839, it is necessary to restart all Clish daemons for this Clish command to become available (does not apply if updating from older CPUSE builds) - refer to section "(3) Download the latest build of CPUSE Agent and What's New" - Step "(3-C) How to manually install the CPUSE Agent package" - Step 5. If this setting is enabled (default), then, if an updated version of CPUSE (Gaia Software Updates) Agent is available for download, Gaia OS downloads it from Check Point Cloud and installs it automatically (CPUSE Agent "self-update"). Refer to R77 Versions Gaia Administration Guide - chapter "CPUSE" - section "Configuring CPUSE Mail Notifications - WebUI". In order to configure a mail server, use the Mail Notification page, found in the advanced view mode. System Management section - Mail Notification page will open. 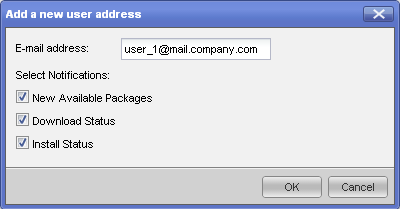 Configure the mail server and the root user for this mail server. Click on Add button to add a user, to whom e-mail notifications should be sent. Add the user's e-mail address and select for which categories to send the e-mail notifications - click on "OK" button. By selecting the user's e-mail address in the list, you can see and change on-the-fly the categories, for which the e-mail notifications are sent to this user. Refer to R77 Versions Gaia Administration Guide - chapter "CPUSE" - section "Configuring CPUSE Mail Notifications - clish". Note: SmartConsole package will be available only on machine that is configured as Security Management Server / Multi-Domain Security Management Server, or as a StandAlone (Security Management Server and Security Gateway). SmartConsole package appears in category "Minor Versions (HFAs)". Either select the package - click on Download button on the toolbar. Either select the package - click on Install Update button on the toolbar. The SmartConsole package will be unpacked. Gaia Portal will offer to download the SmartConsole.exe file. Note: SmartConsole package appears in category "HFAs". 1. Download SmartConsole package on the Gaia server. to your client machine, and will also be available in Overview Download Now. If Gaia Portal is currently opened, then it will offer to download the SmartConsole.exe file. The CPUSE Agent (Gaia Software Updates Agent) is installed on every Gaia-based machine (R75.40 and above) and it is responsible for all software deployment process on that machine. All relevant software updates are uploaded to Check Point Download Center. CPUSE Agent displays software updates that are relevant only to this specific machine. Note: For each official release and recommended hotfix, CPUSE Offline package can be downloaded from the relevant solution article. to Software Updates section (in Gaia OS R75.40 - R77.10) - Status and Actions page with status Available for Download. If new software updates are available, they are shown in the output of show installer packages available-for-download command. Packages are installed based on the CPUSE (Gaia Software Updates) Agent Policy - either manually, on schedule, or automatically. Output of the show installer policy downloads command. Exists in all builds of CPUSE Agent. Contains detailed technical log for administrators and for troubleshooting. This log file is rotated when its size reaches 2 GB. Up to 10 rotated files are kept (DeploymentAgent.log.1, DeploymentAgent.log.2, etc.). Exists in CPUSE Agent builds 710 and above. Contains general messages for users. This log file is not rotated. In "Gaia Portal" - go to "Upgrades (CPUSE)" section (in Gaia R77.20 and above) / to "Software Updates" section (in Gaia R75.40 - R77.10) - click on "Status and Actions" page - scroll to the bottom - click on "Event Log" button. Click on the "Hotfixes" link near the version. A pop-up "Hotfixes Information" appears. Version (build) of the installed Deployment Agent is displayed at the bottom. $CPDIR/bin/cpwd_admin start -name DASERVICE -path "/opt/CPda/bin/DAService_script" -command "DAService_script"
When started, installation process is automatic and does not require any interaction from the user. Pre-install validation (installation type (GW/MGMT), package validation, disk space, CRs conflicts, version compatibility). For details about verification checks run by CPUSE, refer to sub-section (5-D) CPUSE verification checks. Unpack the new CPUSE package. Backup the current CPUSE package. Stop Check Point services ('cpstop'). Prepare diff-files (what exactly should be replaced). Replace target files. Rollback, if installation fails. Register the installed package in Check Point Registry. Reboot (automatically) / Start Check Point services ('cpstart'). Rollback (uninstall), if self-test failed (only if this option is enabled in the CPUSE policy). machine type (Check Point Appliance/Open Server), upgrade path). For details about CPUSE verification checks, refer to sub-section (5-D) CPUSE verification checks. Install new version files onto the new disk partition. FireWall / VPN / SecureXL / CoreXL / Hardware configuration on Security Gateway). Setup products on the new disk partition. Reboot the machine from the new partition. Import database (on Management Server), last products configurations, fetch policy (on Security Gateway). Run post-install self-tests (as configured before the installation). On Security Management Server / Multi-Domain Security Management Server, at the beginning of an upgrade, CPUSE Agent automatically runs the Pre-Upgrade Verifier - a validation tool, similar to the pre-upgrade verifier that runs as a part of the Management Server migration process. In case of an error in one of the verification tests, the administrator is required to first follow the instructions and resolve the issue, and only then to start the upgrade again. CPUSE Agent has a self-test feature that runs after installation and checks whether the installation has succeeded - and its purpose is to validate that the Gaia OS machine is up and running. 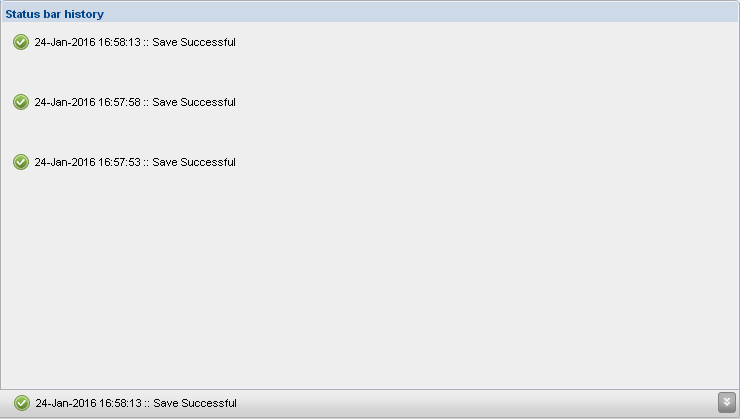 Administrator can enable the option to automatically roll back the installation in case of a self-test failure. Therefore, by default, there is no roll back during a self-test failure. In Gaia Portal, navigate to Upgrades (CPUSE) section (in Gaia R77.20 and above) / to Software Updates section (in Gaia R77.10 and lower) - click on Policy. Please note the self-test failure condition is different from a regular installation failure - during a regular installation failure, there is an automatic roll back and the machine returns to a point before the installation started. All CPUSE packages are signed by Check Point using an SHA-256 digital signature since April 2015. Until then, CPUSE packages were signed by MD5 and SHA-1 digital signature. Note: If CPUSE is served from an on-premises Private ThreatCloud, then all CPUSE packages are signed at the source (i.e., by Check Point) using an ECDSA P-521/SHA-512 digital signature. CPUSE Agent performs SHA-256 signature verification and MD5 integrity verification of the downloaded files. If the either verification fails, the download is considered as failed. At the beginning of every installation / uninstall of a Hotfix or Minor Version, CPUSE Agent asks the user whether to perform a reboot automatically when install / uninstall completes. 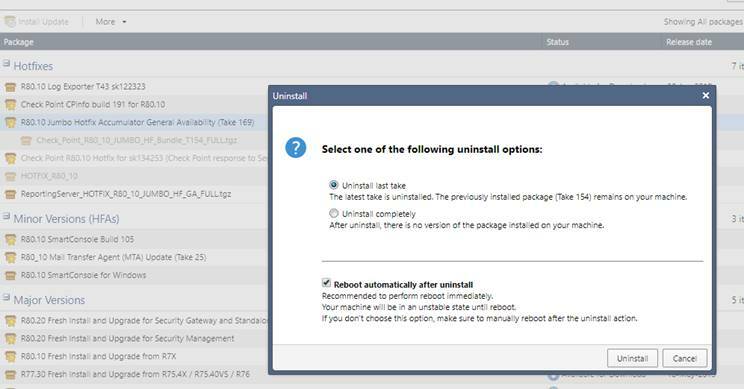 The purpose of the suppress reboot functionality is to allow the administrator to perform post-install / post-uninstall actions (that also require reboot) and thus reduce the number of reboots. Important Note: During the installation / uninstall of a package, all Check Point services are stopped (cpstop). Therefore, it is strongly recommended to complete all the necessary maintenance operations and reboot the machine as soon as possible, to restore the normal operation of Check Point software. For more details, refer to sk113045. sk83520 - How to verify that Security Gateway and/or Security Management Server can access Check Point servers? sk107508 - Download of CPUSE package fails with "Error: Bad or slow connection to the Check Point Cloud"
sk109817 - Installation of Jumbo Hotfix Accumulator using CPUSE fails with "Failed creating backup archive"
1 For customers with R77.30 who installed only Legacy packages and want to install the CPUSE Jumbo for the first time: in this case, the Legacy package should be uninstalled prior to the CPUSE installation. On the toolbar, click on the More button and click on Import Package. Important Note: This option was moved from the More button to the main page (upper right corner) starting in CPUSE Agent Build 1272. Important Note: This option was removed from Gaia Portal starting in CPUSE Agent Build 1127. Note: This option is used only to upgrade to Major releases R75.40VS / R76 GA / R77.X (refer to the upgrade map) using the Legacy CLI upgrade package. Download the Legacy CLI upgrade Gaia OS package of the supported Major release (R75.40VS / R76 / R77 / R77.10 / R77.20 / R77.30). Upload the Legacy CLI upgrade package. Refer to section "(4) How to work with CPUSE" - refer to instructions for Gaia Portal. Refer to R77 Versions Gaia Administration Guide - chapter "CPUSE" - "Reviewing CPUSE ? clish". Refer to R77 Versions Gaia Administration Guide - chapter "CPUSE" - "Configuring a CPUSE Policy - clish", and "Configuring CPUSE Mail Notifications - clish". Refer to R77 Versions Gaia Administration Guide - chapter "CPUSE" - "Downloading and Installing with CPUSE - clish". Note: The progress (in per cent) of the download/install/uninstall actions is displayed in both Clish and in "Gaia Portal" - "Upgrades (CPUSE)" section (in Gaia R77.20 and above) / to "Software Updates" section (in Gaia R75.40 - R77.10) - "Status and Actions" page. The "set installer download_mode schedule" sub-command is disabled - use the Gaia Portal. The "set installer install_mode schedule" sub-command is disabled - use the Gaia Portal. "show installer available_packages" command reads the information about the packages that are pending download from the $DADIR/bin/pd_file file (exists only while the Gaia Software Updates Agent service is running). "show installer available_local_packages" command reads the information about the packages that were downloaded and are pending installation from the $DADIR/bin/pi_file file (exists only while the Gaia Software Updates Agent service is running). "show installer installed_packages" command reads the information about the packages that were installed from the $DADIR/bin/pu_file file (exists only while the Gaia Software Updates Agent service is running). "show installer package_status" command reads the information about the status of packages from the $DADIR/bin/prv_file file (exists only while the Gaia Software Updates Agent service is running). Information about the packages that are pending uninstall is stored in $DADIR/bin/pu_file file (exists only while the Gaia Software Updates Agent service is running). Important Note: Requirements for free disk space exist. On this tab, user will see the available / manually uploaded hotfix packages. When a software update is "Available for Download", click on "Download" button. When a software update is "Available for Install", user can verify whether there are any warnings about this update and whether this update can be installed without conflicts. Click on "Actions" button and then click on "Verifier" button (formerly known as "Check Install") - a pop-up will appear with "Verifier results". If there are no warnings/conflicts, then click on "Install Update" button. 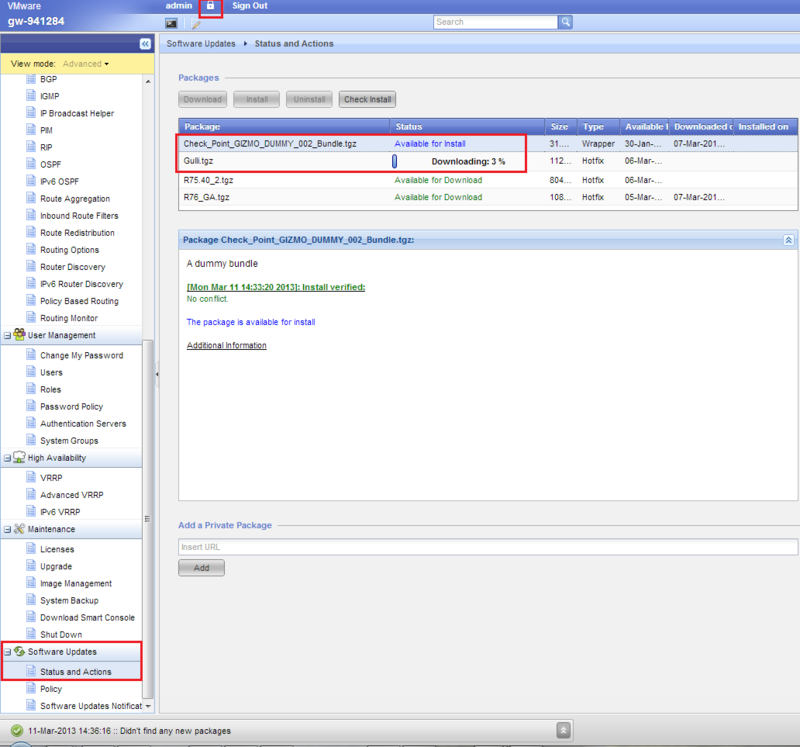 After a software update is installed, user can see the installation log by clicking on the 'scroll' icon in the "Logs" column. A new window will open. Information can be selected and copied from this window. If a software update was installed and has to be uninstalled, click on "Uninstall" button. Click on "Actions" button - click on "Export" button. The update will be saved as TAR file on your computer. A software update can be manually imported to this Gaia machine (for example, if this machine is disconnected from the Internet). Packages that were specifically created to be installed using Gaia Software Updates. Contact Check Point Support to get the required Gaia Software Updates package for Offline installation. Connect to the Gaia Portal on your machine. Obtain the lock over the configuration database (click on the lock icon at the top - near "Sign Out"). Navigate to "Upgrades (CPUSE)" / "Software Updates" section - "Status and Actions" pane. Click on "Actions" button - click on "Import" button. Browse for the TGZ file that was provided by Check Point Support - click on "Upload". Install the uploaded package either in Gaia Portal, or in Clish - see the relevant instructions above. Packages that were exported from another Gaia machine using Gaia Software Updates. Export the relevant update package (that was already downloaded / installed) from a source Gaia machine (that is connected to the Internet) to your computer. If needed, transfer this file to an external storage device. Open the Gaia Portal of the target Gaia machine (on which this update package should be imported). Go to "Gaia Portal" - "Upgrades (CPUSE)" / "Software Updates"section - "Status and Actions" page. Browse for the TAR file that was exported from a source Gaia machine - click on "Upload". It is not a valid exported "Gaia Software Updates" package. Click on "Actions" button - click on "Add Private Hotfix" button. In the "Add Private Package" window, paste the special link to the customized package / image (sent to you by Check Point) - click on "Add" button. Monitor the progress in the "Important Messages" section at the bottom (scroll down). The customized package / image will appear in the list of available packages with status "Available for Download". Proceed as with regular hotfix package / image. User can monitor the general progress in the "Important Messages" section at the bottom (scroll down). For complete log, click on "History" button. Information can be selected and copied from these windows. In the "Important Messages" section, the messages appear from bottom-to-top (most recent log is at the top). In the "Important Messages Log" ('History') window, the messages appear from top-to-bottom (most recent log is at the bottom). On this tab, user will see the available / manually uploaded upgrade packages and fresh install images. When an image is "Available for Download", click on "Download" button. When an image is "Available for Install", user can verify whether there are any warnings about this image and whether this image can be installed without conflicts. If an image is already installed, you can click on "Reinstall" button. If an upgrade image was installed and has to be uninstalled, click on "Uninstall" button. Important Note: There is no uninstall option for fresh install images. You can store this TAR file for backup purposes, or transfer it to another Gaia machine. An image can be manually imported to this Gaia machine (for example, if this machine is disconnected from the Internet). Export the relevant image from a source Gaia machine to your computer. Open the Gaia Portal of the target Gaia machine (on which this image should be imported). Go to "Gaia Portal" - "Upgrades (CPUSE)" / "Software Updates" section - "Status and Actions" page. Gaia Portal will only accept a TAR file that was exported from another Gaia machine (it contains the image TGZ file and special metadata TGZ file). For more information about "deployment-mail-notification", refer to "Configuring e-mail notifications in Clish" section. Note: The progress (in per cent) of the download/install/uninstall actions is displayed in both Clish and in "Gaia Portal" - "Upgrades (CPUSE)" / "Software Updates" section - "Status and Actions" page.
. R77 - Check_Point_R77.tgz (1.18 GB) - <b>Check Point R77.
. HOTFIX_GULLI_HF1 - Check_Point_R77_hotfix_sk95245.tgz (2.99 MB) - This hotfix solves Threat Emulation Incorrect MIME encoding.
. HOTFIX_GULLI_HF2 - Check_Point_hotfix_R77_sk96269.tgz (2.97 MB) - This hotfix solves Threat Emulation Incorrect MIME encoding. 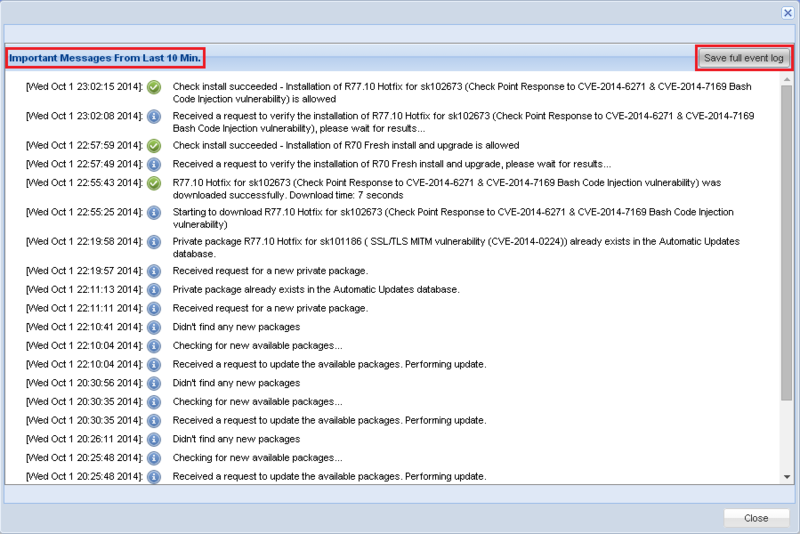 Check_Point_R77_hotfix_sk95245.tgz            - Pre-install validation failed (CRs validation error). Important Note: Requirements for disk space exist - refer to "System requirements and limitations" section. When a software update is "Available for Install", click on "Check Install" button to check whether this software update can be installed without conflict. If there are no warnings/conflicts, then click on "Install" button. Note: The progress (in per cent) of the download/install/uninstall actions is displayed only in "Gaia Portal" - "Software Updates" - "Status and Actions". "show installer available_packages" command reads the information about the files that are pending download from the $DADIR/bin/pd_file file (exists only while the Gaia Software Updates Agent service is running). "show installer available_local_packages" command reads the information about the files that were downloaded and are pending installation from the $DADIR/bin/pi_file file (exists only while the Gaia Software Updates Agent service is running). "show installer package_status" command reads the information about the status of software updates from the $DADIR/bin/prv_file file (exists only while the Gaia Software Updates Agent service is running). Information about the files that are pending uninstall is stored in $DADIR/bin/pu_file file (exists only while the Gaia Software Updates Agent service is running). 31 Mar 2019 Updated setion 4C - "How to uninstall a CPUSE package"
08 Apr 2018 Updated Section (2) System requirements and limitations, item G.
10 Oct 2017 Corrected the import instructions in Gaia Portal - correct the name of the button from "Upload" to "Import". 08 Oct 2017 Renamed the "Latest build of CPUSE and What's New" section to the "Download the latest build of CPUSE Agent and What's New". updated the text to show that build 1130 is integrated into R80 GA version. 27 Aug 2017 "Latest build of CPUSE and What's New" section - added new Build 1298. 23 Aug 2017 "Troubleshooting and Related solutions" section - added sk104479. 17 Aug 2017 "Troubleshooting and Related solutions" section - added sk119993. 16 Aug 2017 "Troubleshooting and Related solutions" section - added sk119954. 24 July 2017 "Latest build of CPUSE and What's New" section - added a note that restarting the ConfD daemon should be performed during a maintenance window. 06 July 2017 "System requirements and limitations" section - updated a note that on VSX R80.10, any package can be installed using CPUSE. 27 June 2017 "Latest build of CPUSE and What's New" section - added new Build 1294. Updated the instructions for importing a package in Gaia Portal (by clicking on the Import Package button on the main page). Added link to R80.10 Gaia Administration Guide. 16 June 2017 "Latest build of CPUSE and What's New" section - added new Build 1293. 18 May 2017 Added R80.10 version to the article. 25 Apr 2017 "Latest build of CPUSE and What's New" section - added new Build 1283. 04 Apr 2017 "Latest build of CPUSE and What's New" section - added new Build 1278. Updated the title of this article from "CPUSE - Gaia Software Updates (including Gaia Software Updates Agent)" to "Check Point Upgrade Service Engine (CPUSE) - Gaia Deployment Agent". "Latest build of CPUSE and What's New" section - added the build 1272 back. 20 Mar 2017 "Latest build of CPUSE and What's New" section - temporarily reverted from Build 1272 to the previous Build 1130. 15 Mar 2017 Added relevant screenshots for "Verifier" results. 13 Mar 2017 "Latest build of CPUSE and What's New" section - added new Build 1272. 11 Feb 2017 "Troubleshooting and Related solutions" section - added sk114592. 05 Feb 2017 "Troubleshooting and Related solutions" section - added sk115719. 15 Jan 2017 "Troubleshooting and Related solutions" section - added sk115515. "(4-A) "How to ..." section - improved import instructions for Offline procedure in Gaia Portal. "Troubleshooting and Related solutions" section - added sk111158, sk115243. "(4-A) "How to ..." section - improved notes about VSX mode. "(4-B) "How to ..." section - improved notes about VSX mode. "(4-B) "How to ..." section - "(4-B-b)" subsection - added a list of files that are copied by CPUSE during an upgrade to a Major Version. 14 Nov 2016 "(4-C) "How to ..." section - improved notes. 03 Nov 2016 "System requirements and limitations" section - added clarifications about the required license and contract. 02 Oct 2016 "Latest build of CPUSE and What's New" section - added new Build 1130. 21 Sep 2016 "Troubleshooting and Related solutions" section - added sk113268, sk113269, sk113270. 21 Aug 2016 "Latest build of CPUSE and What's New" section - added new Build 1127. 23 June 2016 "(4-D) "How to ..." section - improved the description of "installer agent start" command. 21 June 2016 "(4-D) "How to ..." section - improved the description of "installer agent <disable|enable>" and "installer agent <stop|start>" commands. 16 June 2016 "Latest build of CPUSE and What's New" section - added new Build 1005. 14 Apr 2016 "Latest build of CPUSE and What's New" section - added new Build 994. "Troubleshooting and Related solutions" section - added sk105746. "System requirements and limitations" section - added relevant Domain objects. 09 Apr 2016 "Latest build of CPUSE and What's New" section - added a note about manual installation of CPUSE Agent RPM. 31 Mar 2016 Improved text readability. 30 Mar 2016 "Troubleshooting and Related solutions" section - added sk109359. 27 Mar 2016 Article was redesigned and updated. 03 Jan 2015 Minor text improvements. 03 Jan 2015 "System requirements and limitations" section - updated the information. 20 Nov 2015 Add explanation for "DAClient" commands. 20 Sep 2015 "System requirements and limitations" section - updated the information. 29 July 2015 Corrected Clish syntax for starting and stopping the Gaia Software Updates Agent daemon. 26 July 2015 Added Clish syntax for Build 802 and above. 22 July 2015 Added sk106696 to "Related solutions" section. 11 Mar 2015 "System requirements and limitations" section - added instructions for allowing CPUSE to work with Check Point cloud. 29 Jan 2015 "System requirements and limitations" section - updated the information that option "Automatically download Contracts and other important data (Recommended)" should be enabled in SmartDashboard. 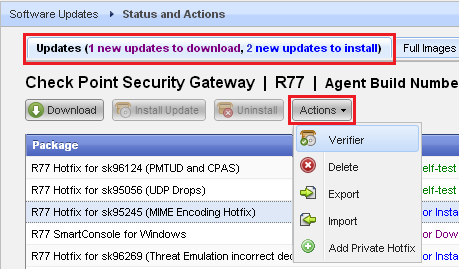 05 Oct 2014 Added description for Gaia Software Updates Agent version from 710 to 747. 11 Sep 2014 "Overview" - "Description" section - added a note that CPuse mechanism supports deployment of Major Versions (starting from build 502). "Software Updates Notifications" section - updated the information. Updated the notes for "set installer" commands. 24 July 2014 Added a note about the "ping" syntax in $DADIR/bin/connection_test.sh script if Gaia machine is disconnected from the Internet. 15 June 2014 "Related solutions" section - added this new section. 12 May 2014 Updated the information about the "Import" operation in Gaia Portal. 17 Mar 2014 Improvements in HTML design. Added notes about importing an image / package. 12 Dec 2013 Added description for Gaia Software Updates Agent versions from 502 to 615. 03 Mar 2013 First release of this document.